With the developments in taxonomy, the classically used highly conserved 16S rRNA molecular marker has shown some disadvantages among closely related species. For further taxonomic studies of the prokaryotes, specific PCR primers were designed from two conserved regions in the amino acid sequences of the 70-kDa heat shock protein sourced from 20 different genera in actinomycetes. These were used for the amplification of the hsp70 genes in 16 Streptomyces strains. Then, we investigated the phylogenetic relationships among these Streptomyces strains and compared the tree topology based on the hsp70 gene with those based on the previously used markers (16S rRNA and gyrB). To our knowledge, this is the first use of the hsp70 gene as a molecular marker for the taxonomic identification of Streptomyces. The highly conserved 16S rRNA gene, also known as the ‘bacterial fossil’, encodes small subunit of the ribosomal RNA (rRNA) in prokaryotes. It contains 10 variable regions and 11 constant regions (Woese et al. 1975). Phylogenetic analysis based on the 16S rRNA gene is considered to be a simple and appropriate tool for the construction of bacterial phylogenetic relationships. Thus, it is one of the most commonly used methods for identifying microorganisms (Amann et al. 1995; Stackebrandt and Goebel 1994; Woese et al. 1990). Recently, molecular techniques based on the PCR, such as DGGE, LH-PCR, cPCR, SSCP, ARDRA, AFLP, RFLP, FISH and T-RFLP, have provided outstanding tools for the detection, identification, and characterisation of microorganisms based on this gene region (Giraffa and Neviani 2001). However, the high percentage of sequence similarity among closely related species limits its effectiveness (Ash et al. 1991; Christensen et al. 1998; Yamamoto and Harayama 1998). Consequently, other protein-encoding gene sequences have been evaluated for use as tools in phylogenetic and taxonomic identification (Küpfer et al. 2006). The gap and ompA genes, which encode glyceraldehyde-3-phosphate dehydrogenase and outer-membrane protein 3A respectively, were used to identify five species of Escherichia, but these did not form a monophyletic group (Lawrence et al. 1991). In addition, the sequences of recA, rpoB, infB, fusA and nifD, which are involved in DNA recombination or DNA repair, the RNA polymerase β-subunit and translation initiation factor 2, the protein synthesis elongation factor-G and the α subunit of the dinitrogenase protein were also used to describe the phylogenetic relationships of different bacterial genera (Das et al. 2014; Hedegaard et al. 1999; Holmes et al. 2004; Lloyd and Sharp 1993; Mollet et al. 1997). Unfortunately, despite having a higher phylogenetic resolution than the 16S rRNA sequences (Yamamoto and Harayama 1996), some of the phylogenetic trees did not form distinct phylogenetic groups (Dauga 2002). Recently, the gyrB gene, which encodes the subunit B protein of DNA gyrase, was proposed as a suitable phylogenetic marker. It was most commonly used in the identification and classification of the evolutionary relationships of closely related species, due to its success (Kasai et al. 2000; Venkateswaran et al. 1998; Yamada et al. 1999; Yamamoto et al. 1999; Yamamoto and Harayama 1998). Heat shock proteins (HSPs) are groups of stress-response proteins that have been demonstrated to be universally distributed across biological groups from bacterial to human beings (Hunt and Morimoto 1985). According to their biological activities and apparent molecular weights, HSPs are classified into four major families: hsp90, hsp70, hsp60, and small HSPs including hsp27. A study previously revealed that human hsp70 is 73% identical to Drosophila hsp70 and is 47% identical to Escherichia coli DnaK. These have been considered as useful phylogenetic markers (Hunt and Morimoto 1985). We aimed to develop a set of novel PCR primers that allow for the amplification of the hsp70 gene. These were then used to study the phylogenetic relationships among Streptomyces strains. All the Streptomyces strains used in this study were collected in our laboratory. E. coli strains were typically cultured in Luria–Bertani (LB) medium or on LB agar plates at 37 °C (Sambrook and Russell 2001). Where appropriate, the media contained the antibiotic ampicillin (1 μg/mL). To prepare the total genomic DNA of Streptomyces, Tryptone Soy Broth liquid medium containing 0.5% glycine was used for culturing the strains (Hopwood et al. 1985). All the chemicals and reagents used were of the highest purity commercially available. Taq polymerase was purchased from TaKaRa Bio Inc. (Japan). All bacteria genomic DNA was isolated using the method described by Hopwood (Hopwood et al. 1985). PCR amplification was performed using an Eppendorf Personal Master Cycler. A master mix of 50 μL used for the PCR reaction contained: 5.0 μL 10X PCR Buffer, 3.0 μL MgCl2 (25 mM), 4.0 μL dNTPs (2.5 mM each), 1.0 μL of degenerate PCR primers (20 mM each), 2.5 μL dimethyl sulfoxide, 1.0 μL genomic DNA (ca.0.2 μg) and 0.5 μL Taq polymerase. The amplification conditions were as follows: (a) 1 cycle for 3 min at 94 °C; (b) 94 °C for 1 min, 64 °C for 1 min, then 72 °C for 1.5 min for 35 cycles; (c) 1 cycle at 72 °C for 10 min. In addition, the 16S rRNA gene and the gyrB gene were amplified by PCR using the primers as described previously (Calcutt 1994; Edwards et al. 1989). The PCR products were directly sequenced by an ABI Genetic Analyzer 3730 (Invitrogen Bio Inc., Shanghai, China) which used the 16S rRNA primers and F-1S (5′-GAGGTCGTGCTGACCGTGCTGCA-3′)/F-2R (5′-GTTGAT GTGCTGGCCGTCGACGT-3′) for gyrB (Hatano et al. 2003). All PCR products were analyzed using 1.0% agarose-gel electrophoresis, stained with ethidium bromide (AMRESCO, USA). PCR products were directly sequenced by ABI Genetic Analyzer 3730 (Invitrogen Bio Inc., Shanghai, China) which used the sequence primers U1F (5′-CGTGCAGTCGGTATCGACCTCGG-3′) and 2R (5′-CGATGCCGTTGGCGTCGATGTC-3′). 16S rRNA and hsp70 gene sequences were compared to the GenBank nucleotide and protein databases using BLASTN and BLASTX (http://blast.ncbi.nlm.nih.gov/Blast.cgi). Phylogenetic and molecular evolutionary analyses were conducted using MEGA 4.1 (Tamura et al. 2007). Briefly, for the construction of bootstrap test of 16S rRNA and hsp 70 gene phylogenetic trees, the algorithm for the neighbour-joining (NJ) method (Saitou and Nei 1987) and Kimura 2-parameter model (Kimura 1980) were used. Percentage bootstrap values based on 1000 resampled datasets are shown. 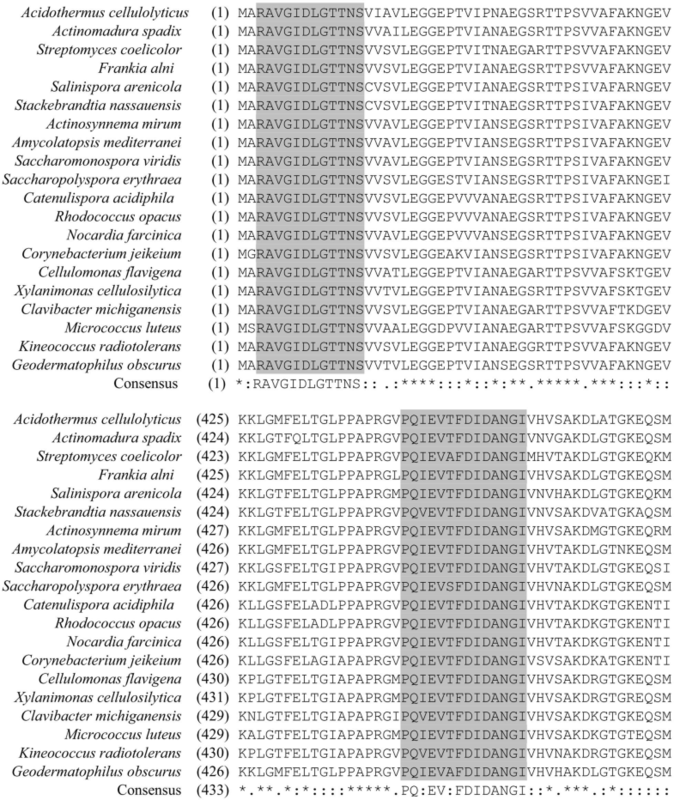 All the sequences used in this paper were deposited into GenBank under the accession numbers JF443561–JF443576 and HQ607409–HQ607473, as indicated in Fig. 3. PCR primers for the amplification of hsp70 (Dna K) genes were designed from two conserved regions of the amino acid sequences of the 70-kDa heat shock protein from 20 genera in the actinomycetes (Fig. 1). Then, one primer pair was designed for amplifying approximately 1300 bp of the hsp70 gene fragment and the other primer pair was used to direct sequencing (Table 1). The primer pairs were aligned with the other gene sequences in the GenBank using BLAST (http://www.ncbi.nlm.nih.gov/BLAST). Primer optimization experiments were performed using a single primer pair (hsp70-U7F and hsp70-1326R) to amplify the hsp70 gene of Streptomyces coelicolor. The results showed that the sequences of the PCR product amplified from the primer pair was the same as the hsp70 genes retrieved from the Genbank database. Then, the primer pair described above was used to amplify the hsp70 genes in 16 Streptomyces strains. The PCR products with the expected size of approximately 1300 bp corresponded to those predicted from known hsp70 sequences (Fig. 2). When the phylogenetic trees constructed from the nucleotide sequences of hsp70 and the 16S rRNA gene from the same 16 Streptomyces reference strains were compared, analysis showed there were only slight differences between the phylogenetic structures for these Streptomyces. Based on the bootstrap values and the level of the stability of the branches, the 16 strains of Streptomyces were divided into four stable subgroups (A, B, C and D) (Fig. 3a, b). 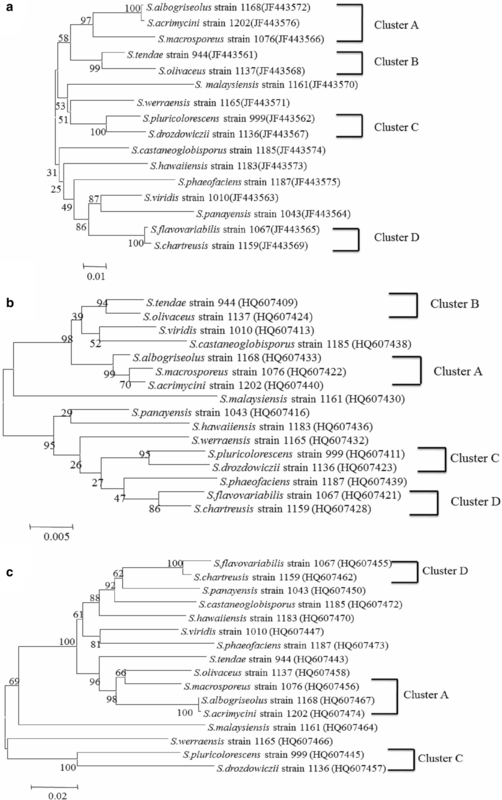 According to the hsp70 phylogenetic tree, two strains, S. albogriseolus strain 1168 and S. acrimycini strain 1202, clustered closely in the A subgroup branch with a bootstrap value of 100%, whereas S. acrimycini strain 1202 and S. macrosporeus strain 1076 clustered closely in the 16S rRNA phylogenetic tree with a bootstrap value of 70%. Therefore, subgroup A of hsp70 phylogenetic tree showed higher stability than the 16S rRNA phylogenetic tree. Furthermore, the strains in B, C and D subgroups also displayed higher stability for the hsp70 phylogenetic tree compared to the phylogenetic tree constructed from 16S rRNA. In addition, two strains, S. viridis strain 1010 and S. panayensis strain 1043, were outside the four subgroups and clustered closely in hsp70 phylogenetic tree with a bootstrap value of 87%, and S. viridis strain 1010 clustered closely with S. castaneoglobisporus strain 1185; S. panayensis strain 1043 clustered closely with S. hawaiiensis strain 1183 with bootstrap values of 52% and 29%, respectively. These results showed that the phylogenetic tree constructed from hsp70 had a reasonable topology in comparison to the 16S rRNA phylogenetic tree. Comparison between the hsp70 and gyrB phylogenetic trees showed that there were some inconsistencies, leaving only 3 subgroups A, C and D (Fig. 3a, c). In both phylogenetic trees, these 3 subgroups were congruent and stable, but hsp70 phylogenetic tree was even more reasonable. For example, in the hsp70 and gyrB phylogenetic trees, subgroup D clustered closely with S. panayensis strain 1043 with a bootstrap value 87% and 62%, respectively; it seems that the branch in the hsp70 phylogenetic tree had a reasonable topology. Also, in the hsp70 phylogenetic tree, S. viridis strain 1010 and S. panayensis strain 1043 formed a more stable branch, but there were some differences from the phylogenetic tree based on gyrB. Among the phylogenetic trees (hsp70, 16S rRNA and gyrB), it seems that the phylogenetic relationships of S. viridis strain 1010 and S. panayensis strain 1043 in the hsp70 phylogenetic tree was more reasonable. In modern taxonomy classifying bacteria, the 16S rRNA and gyrB gene sequences have been considered to be simple and the most commonly used methods for the investigation of phylogenetic relationships (Dauga 2002; Fox et al. 1980; Fukushima et al. 2002; Hillis and Dixon 1991). Previous research has shown that the average substitution rate for 16S rRNA was 1% per 50 million years which is slower than that of gyrB gene (0.7%–0.8% per million years) (Ochman and Wilson 1987). Thus, the gyrB sequence analysis may better distinguish the phylogenetic relationships at the species level in some bacterial groups. However, this phylogenetic approach also has its limitations. Recently, rpoB and recA sequence analysis along with randomly amplified polymorphic fingerprinting could effectively identify Bacillus species with highly similar 16S rRNA gene sequences; these were hard to identify based on 16S rDNA sequence analysis (Mohkam et al. 2016). Further, several mass spectrometry methods were used for the classification and identification of bacteria and other microorganisms (Sauer and Kliem 2010). For example, MALDI-TOF MS analysis was demonstrated to be a rapid method for bacteria identification from mining samples (Avanzi et al. 2017; Książczyk et al. 2016; Schröttner et al. 2016). Although many new analytical tools were recently used for the classification and identification of bacteria, there is still urgency for the discovery of new molecular markers. The 60 kDa heat-shock protein family hsp65 gene has also been used successfully for species identification of cultured clinical isolates of the genus Mycobacterium (Rogall et al. 1990). The hsp70 gene which is highly conserved between 16S rRNA and gyrB sequences is distributed universally from bacteria to human beings (Hunt and Morimoto 1985). Consequently, it has the potential to be used as a phylogenetic marker for the investigation of phylogenetic relationships. However, using hsp70 gene as a molecular marker for taxonomic identification is still rare to our knowledge. Therefore, in this study, we attempted to develop novel PCR primers (hsp70-U7F and hsp70-1326R) for the investigation of the phylogenetic relationships of Streptomyces strains through amplification of the hsp70 gene. Furthermore, the PCR products can be directly and rapidly sequenced by the sequence primers U1F and 2R. Compared with the phylogenetic tree based on the 16S rRNA gene and the gyrB gene, the hsp70 phylogenetic tree has advantages for the investigation of the phylogenetic relationships of Streptomyces strains. Firstly, analysis based on the hsp70 provided a resolving power higher than that of the 16S rRNA gene analysis in differentiating among species. Secondly, separation among closely related species such as S. panayensis strain 1043, S. viridis strain 1010 and S. phaeofaciens strain 1187, show that the hsp70 phylogenetic tree provided convincing as well as reasonable phylogenetic relationships. In conclusion, for the first time, this study develops novel PCR primers (hsp70-U7F and hsp70-1326R) were used for the investigation of the phylogenetic relationships between 16 Streptomyces strains through amplification of hsp70 gene. This gene may be a good alternative as a molecular marker for the phylogenetic analysis of Streptomyces strains. In the future, hsp70 combined with 16S rRNA and gyrB sequence method may be able to clarify molecular relationship of some controversial phylogenetic relationships of bacteria. WYL and YH conceived project, YH, FXS and WYL designed the study and wrote the paper. WYL and FXS performed the experiments, YH revised the English language. All authors reviewed the results. All authors read and approved the final manuscript. All data analyzed in this article are included in the figures and tables. Any material used in this article is available for search purposes upon request. This work was supported by the National Natural Science Foundation of China (81702905 and 81602512).